Looking for quick, easy and nourishing meals for your Whole30? We’re filling our fridge with these instant soup jars to get us through the January Whole30. These are SO simple to advance prep in bulk, and can be a lifesaver on those inevitable days you’re busy, hangry, or both, to keep you from falling off the wagon! 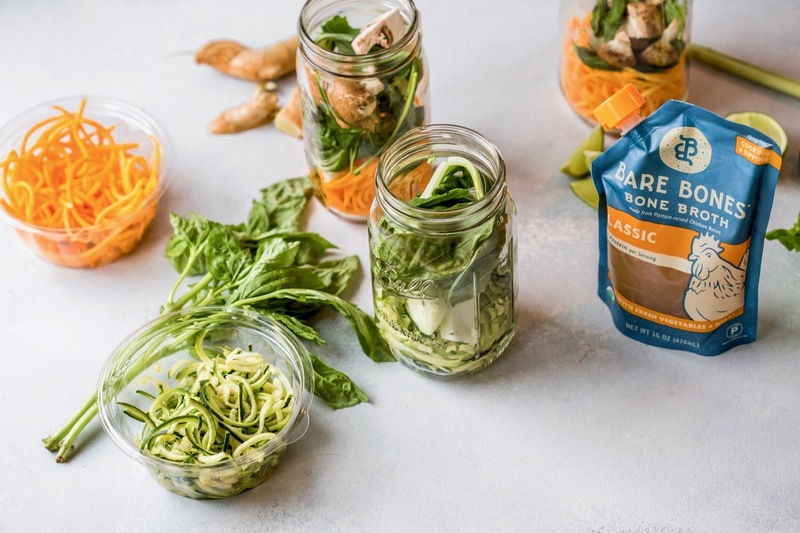 Simply cram a jar full of your favorite veggies, herbs and seasonings, and when you’re ready to eat, pour in warm bone broth, seal the jar and shake, then let it sit for 5 minutes or so to heat up the veggies. Voila! You’ve got yourself a collagen-rich, flavorful and nourishing meal anytime! Add all ingredients to jar, except for bone broth. Seal jars and refrigerate until ready to eat. When ready to eat, heat bone broth until simmering. Pour bone broth into jar, seal closed, shake thoroughly, and set aside for 5 minutes. YESSSSS, that’s awesome, Tom! Let us know if we can answer any questions or do anything to help you on your journey. We’re excited you’re joining us. It really is a life changer. hi! what size jar/container would you recommend? A 32oz jar works great, or you can go smaller and just add broth to fill.